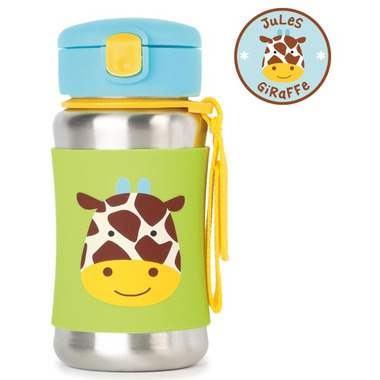 Skip Hop ZOO Stainless Steel Straw Bottle has a no-slip silicone sleeve to protect little hands from cold surfaces. 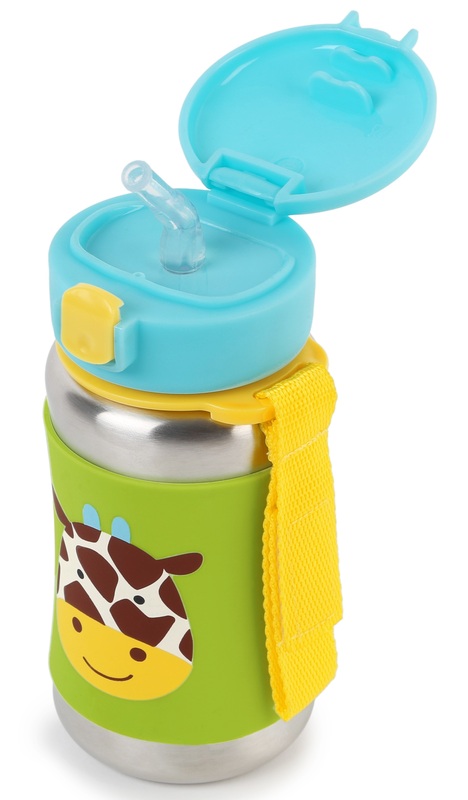 Featuring signature Skip Hop Zoo characters, it has a handy grab-me strap that attaches to anything, along with a pop-up lid so the flexible straw stays clean. Size (inches): 3.5w x 3.5d x 6h. I got this bottle for my 3.5 year old on a Friday. She used it all weekend and by Tuesday it was leaking... A LOT! The stainless steel had a huge crack in it at the seam by the bottom. She didn't even drop it on anything hard, maybe a couple times on our cork flooring. Unbelievable that it could break so easily and so quickly. I had such high hopes with a stainless steel bottle.... would not recommend! This is a great bottle, keeps warm liquids warm for a while as well as cool liquids cool. Only complaint, my 16 month old twins tend to drop their cups a lot and this one is pretty banged up after a month. Not to mention the lids (bought 2) both snapped off and the clip broke so now it can only be used at home. Not very sturdy. Great bottle! My 20 month old loves it - it's the perfect size and very durable too (been dropped a few times and the lid comes off but snaps right back on). We get lots of compliments on it too!